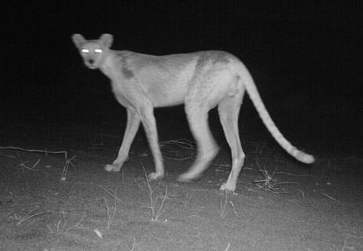 In March of 2009 we posted about photos of the rare Saharan cheetahs caught on wildlife cameras. 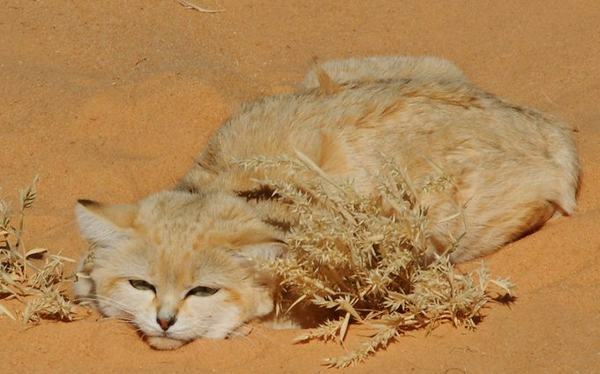 Recently more photos have been released by the Sahara Conservation Fund showing a ghostly cheetah and other wild cats and other wildlife, including this wonderful photo of a sand cat. The animal is so rare and elusive scientists aren’t sure how many even exist, though they estimate from the few observations they’ve made of the animal and tracks that fewer than 10 individuals call the vast desert of Termit and Tin Toumma in Niger home. Fewer than 200 cheetahs probably exist in the entire Sahara. The Saharan cheetah is listed as critically endangered on the 2009 IUCN Red List of Threatened Species. The Saharan race of cheetah (Acynonix jubatus hecki) is very rare, and one of the most specialized and threatened in Africa. As part of a major strategy to conserve Sahelo-Saharan wildlife, in collaboration with the Sahara Conservation Fund we are establishing a project to study and protect Saharan carnivores in the Termit/Tin Toumma region of north Niger. We aim to improve our understanding of sympatric Saharan carnivores, and evaluate the impact of human activities on carnivore populations, and that of carnivore predation on livestock. One of the projects aims is to produce an action plan prepared jointly with local land-users to minimize human-carnivore conflict in the Termit/Tin Toumma. it not yet known if Saharan cheetahs are more closely related to other cheetahs in Africa, or those living in Iran, which make up the last remaining wild population of Asiatic cheetahs. Photos by John Hunter of cheetahs and other animals in Kenya. The heliostats focus concentrated sunlight on a receiver which sits on top of the tower. Within the receiver, the concentrated sunlight heats molten salt to over 1000 degrees Fahrenheit. 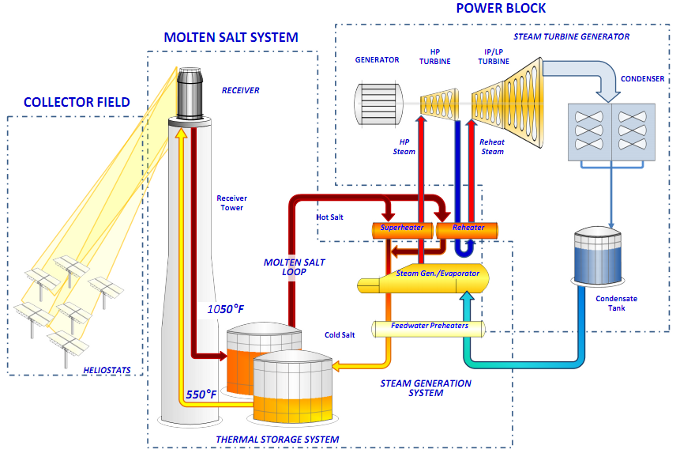 The heated molten salt then flows into a thermal storage tank where it is stored, maintaining 98% thermal efficiency, and eventually pumped to a steam generator. The steam drives a standard turbine to generate electricity. This process, also known as the “Rankine cycle” is similar to a standard coal-fired power plant, except it is fueled by clean and free solar energy. This is another green energy project that has a great deal of potential. There is a great need for such new energy sources and hopefully quite a few of these projects will let us enjoy a greener and more sustainable way to meet our future energy needs. For those interested in the business aspects of this energy project: United Technologies provided SolarReserve with an exclusive worldwide license to develop projects using the proprietary molten salt power tower technology, which has been in development for nearly three decades. As would be expected with significant new scientific claims, scientists are examining the evidence. On her blog, Rosie Redfield, who runs a microbiology research lab in the Life Sciences Centre at the University of British Columbia, disputes NASA’s recent claims. This is how science is suppose to work. Scientists provide evidence. 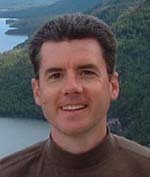 Other scientists review the evidence, try to verify the claims with experiments of their own and the scientific inquiry process moves toward new knowledge. NASA’s shameful analysis of the alleged bacteria in the Mars meteorite made me very suspicious of their microbiology, an attitude that’s only strengthened by my reading of this paper. Basically, it doesn’t present ANY convincing evidence that arsenic has been incorporated into DNA (or any other biological molecule). The authors then grew some cells with radioactive arsenate (73-As) and no phosphate, washed and dissolved them, and used extraction with phenol and phenol:chloroform to separate the major macromolecules. The protein fraction at the interface between the organic and aqueous phases had about 10% of the arsenic label but, because the interface material is typically contaminated with liquid from the aqueous phase, this is not good evidence that the cells’ protein contained covalently-bound arsenate in place of phosphorus. About 75% of the arsenic label was in the ‘supernatant ‘fraction. The authors describe this fraction as DNA/RNA, but it also contains most of the small water-soluble molecules of the cell, so its high arsenic content is not evidence that the DNA and RNA contain arsenic in place of phosphorus. 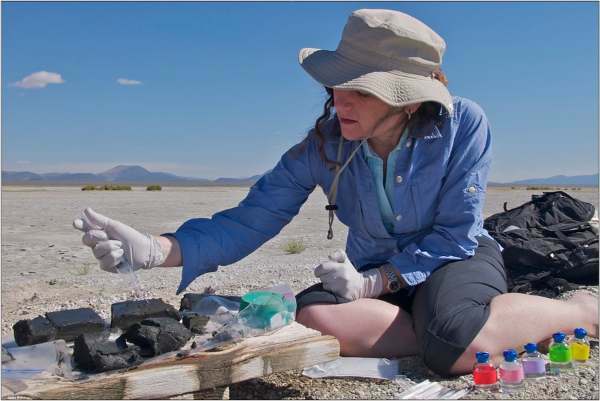 The authors use very indirect evidence to argue that the distribution of arsenic mirrors that expected for phosphate, but this argument depends on so many assumptions that it should be ignored. New claims have to provide strong evidence. time will tell if this discovery is actually a discovery. It will be amazing if it is, so I am pulling for it. But the story will need to have much more confirmation before we can be certain. The study published in Science has a number of flaws. In particular, one subtle but critical piece of evidence has been overlooked, and it demonstrates that the DNA in question actually has a phosphate – not an arsenate -backbone. Wolfe-Simon et al. used a technique called nanoSIMS to analyze elemental concentrations of the agarose gel at the location of the DNA band. They determined that the part of the gel containing DNA also contained both arsenic and phosphorus. But what did they really analyze? The answer is that the nanoSIMS determined the concentration of arsenic in the gel – not specifically in the DNA. Finally, there’s a simple experiment that could resolve this debate: analyze the nucleotides directly. Show a mass spectrum of DNA sequences demonstrating that nucleotides contain arsenate instead of phosphate. This is a very simple experiment, and would be quite convincing – but it has not been performed. 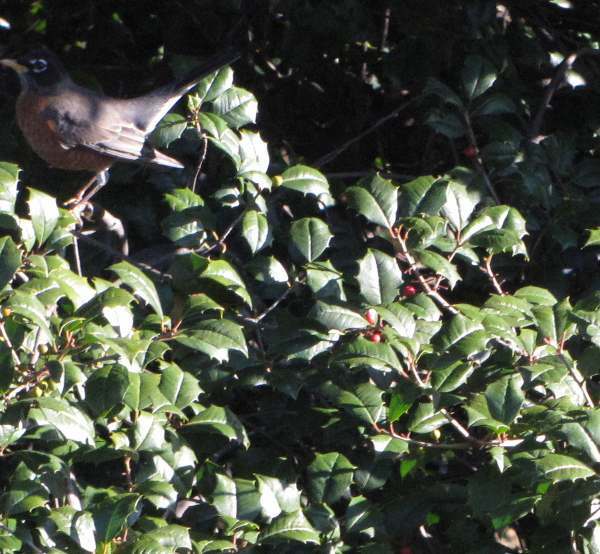 Robins like to attack my holly tree and feed on the berries. Getting photos of them is hard but there are lots of them flying around all excited (I did manage to catch one of them in the photo on the left). This tree was actually here when I moved in but I also do try to nurture and add plants that feed wildlife. I like just planting things that will feed and shelter birds (and others) rather than filling bird feeders myself. There is information on how to use your backyard to promote wildlife. 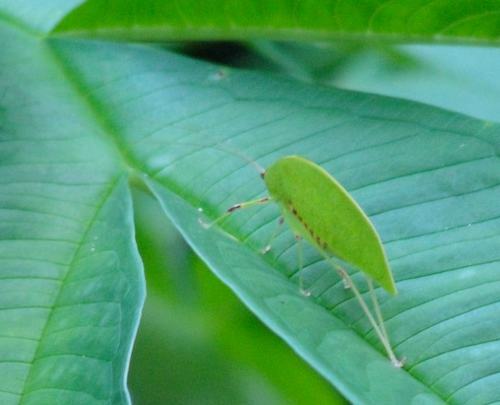 See some more great photos of the hike on Penang Island in Malaysia, from the Capturing Penang blog.